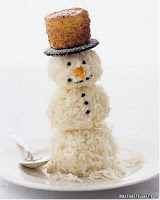 Party Frosting: More Snowmen, of course! This scrumptious guy is from Martha. He is rolled in coconut and the top of his hat is a toasted marshmallow. I am thinking you could use the coconut marshmallow here if you don't have a kitchen torch and make his brim using one side of an oreo... just some thoughts to make things easier! This trio is from one of my favorite cooking stores Sur La Table. 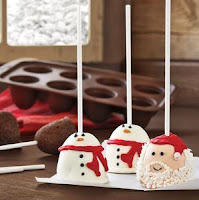 These would be easy to whip up still in time for Christmas and wow everyone! I think I will try them without the sticks, I think they are unnecessary, really.